- Cleanser: 50ml/ 1.8fl.oz. ; Facial Scrub: 20ml/ 0.7fl.oz. ; Hyaluronic Ampoule 2ml/ 0.07fl.oz. ; Face Cream Women: 20ml/ 0.7fl.oz. ; Eye Cream: 5ml/ 0.18fl.oz., Anti-Ageing Body Cream: 50ml/ 1.8fl.oz. 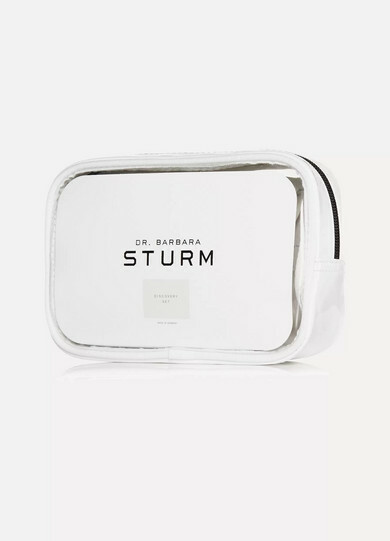 Dr. Barbara Sturm uses her medical knowledge of cells and anti-aging to create skincare with powerful healing benefits. This discovery set contains six hero products that are the perfect introduction to her famed 'Molecular Skincare' regime that she developed alongside Harvard scientists. Each one is travel-sized making it ideal for long-haul flights.